Since February 23, 1998 I have worked at Eaton Vance and am no longer an MIT employee, though I still check in on the scene here occasionally. Previously, I worked as an Analyst Programmer for MIT Information Systems. I worked on the Athena Computing Environment and did WWW development. I graduated from MIT in 1990 with a Bachelor of Science degree in Mathematics. I have tried to organize my home page in such a way as to make it easy to find links to pages I created or helped create. If you have suggestions for better organization, please send me e-mail. 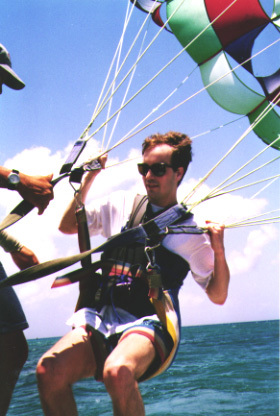 If you don't like the picture of me parasailing (I've only done it once), upgrade your WWW browser to lynx and it won't show up. BRL 2 - the easiest and most powerful environment for developing web/database applications. It is based on the Scheme programming language. IAP Activity page tells how to run it easily on Athena. cgiemail - a program in C for Unix that converts form input into any e-mail format you design. Follow the simple directions from there (copybrl and learnbrl commands). The tutorial is designed for people with HTML and cgiemail experience, but not necessarily any Scheme experience. Here are Athena lockers I have maintained, mostly not useful to folks outside MIT.